One of the most rewarding payoffs for romance readers is to read about the hero and heroine’s wedding. And since this week is all weddings all the time what better time to highlight some of the best weddings in fiction. 1. Anne Shirley and Gilbert Blythe-LM Montgomery built the romantic tension between those two for four entire books. The wedding scene in The House of Dreams isn’t terribly long, but it is incredibly sweet and just perfect. 2. Irene Adler and Godfrey Norton-Who you say? Irene Adler was “the” woman, according to Sherlock Holmes. He is following Irene on behalf of the king of Bohemia when she sneaks into a church. In full disguise, Sherlock follows her only to be pressed into service as a witness at her marriage to a lawyer, named Godfrey. Love the irony, and through Caroline Nelson Douglas’s novels I got to see exactly what Irene saw in Godfrey. 3. Jane Eyre and Mr. Rochester-The wedding that wasn’t. I know it’s a trope now to have someone prevent the wedding at the last second, but think how shocking it was when the story first came out. You can’t stop turning pages after that for sure. How were they ever going to get together after that? What about you? What books had your favorite weddings? What did you like about them? Weddings in books seem to be harder to come by than weddings in movies, so do you have a favorite movie wedding? 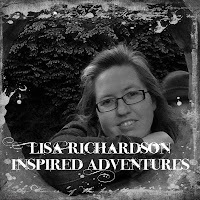 Influenced by books like The Secret Garden and The Little Princess Lisa Karon Richardson’s early books were heavy on boarding schools and creepy houses. It took her awhile to figure out why grandma thought it was unrealistic for boys and girls to share a room. Now that she’s (mostly) all grown-up she still loves a healthy dash of adventure and excitement in any story she creates, even her real-life story. She’s been a missionary to the Seychelles and Gabon and now that she and her husband are back in America, they are tackling a brand new adventure, starting a daughter-work church in a new city. Her first novella, entitled Impressed by Love, part of the Colonial Courtships collection, is coming in May, 2012. Lisa, your posts are always so fun. The first thing I thought of when reading this is so silly, I'm a bit reluctant to say it. But I will, and you can all laugh at me if you want. I always kind of hoped that Nancy and Ned would get married. Do you think Ned would have tried to put an end to Nancy's sleuthing? Now that could be a fun and funny series where Nancy is trying to juggle kids and housekeeping and maybe even a job with a mystery. Of course, I'm sure Hannah Gruen would come to help her. In books, I'd say Anne and Gilbert as well as Laura and Almanzo. That's interesting. I can think of lots of great TV and movie weddings (surely the Grey's Anatomy Post-it wedding is destined to be a classic), but none from books are standidng out to me. My wedding was fairly serious and elegant, but also had some problems, which didn't seem at all funny to me at the time. The unity candle wouldn't light for almost the whole song, and then one of the doves kept flopping to the ground instead of flying away prettily as it was supposed to. At this point in my life I prefer weddings that are relaxed, personal, and even humorous. Lord knows you need a sense of humor to survive a marriage. The scene at the end of Much Ado About Nothing, with Emma Thompson and Kenneth Brannagh was worth watching the whole movie for. Absolutely transcendent! Well, there are times when Ned could definitely be a wet blanket I would hope he wouldn't try to stifle her career, but maybe he would. I like to think he would be Mr. Mom while Nancy solved the crimes. Anne, I agree with all of your choices! Anne, of course Laura and Almanzo! And I loved the wedding scene in The Young Victoria. Talk about Pomp and Circumstance. I loved the way that movie didn't end with the wedding either, but went on to show how they worked out a successful marriage in the midst of so much pressure. Cheryl, I haven't seen Much Ado About Nothing. I tried to record it a couple of weeks ago, but the screen was blank. I finally thought of a tv wedding, and it had a coach just for Anita. It goes back so far, most of you probably wouldn't remember. Cliff and Nina on All My Children. It was so beautiful and romantic. Dina, a confession. I had the idea for the post and then had a hard time populating it with books. But I thought of tons of movie/TV weddings. Anyone remember Dr Quinn's wedding? I was a young teen and loved that show. I remember sighing with happiness when she married Sully. "Ooh, Cheryl I haven't seen that version of Much Ado about Nothing." she said as she logged into her netflix account. Suzie, you're totally right. Ned would have been Mr. Mom. Perfect description! Sully and Dr. Quinn! Good one, Lisa. Oh Suzie, my daughter and I have discussed Ned and Nancy's wedding. There would surely be a mystery at the church or reception hall which distracts Nancy... Ned would be understanding and supportive, as ever. I loved Dr Quinn's wedding to Sully. Sigh. I wish we could've seen the wedding in Persuasion (the Ciaran Hinds version). We see the announcement and the "after," but not the wedding. We should totally write the story of Nancy's wedding to Ned as our next serial story, Susie! What fun!! Lisa, I totally agree. It would be fun. And Susie, yes I would want Ned to be supportive and understanding. My biggest fear for Ned were they to get married, is that he would end up being like Darrin Stephens. Could you just imagine? He was the husband on Bewitched. He nagged and whined all the time about Samantha using her powers. She was always in trouble, and quite frankly, even when I was ten years old I loved when Endora tormented him. Okay. I recognize the name now. No, he was too fussy to be Ned, who is way relaxed and proud of his girl's special abilities. We need someone like Matthew McConaughey to be Ned. Totally laid back. And who can forget the wedding scene in The Sound of Music? I came too late to the discussion. Ned and Nancy? It depends on whether you use the character from the book or television. TV Ned was a geek. Book Ned was a football player and a pretty cool guy. I think he would be supportive of Nancy's sleuthing. Anybody remember the tension between Nancy and Frank Hardy on the old TV series. Juvenile now, but so was I then and ate it up. Same with Laura and Almanzo. My junior high friends and I actually had a party for the wedding. But I have to say, my favorite weddings were from 80s television. Remington Steele and Laura Holt, on that hideous tuna boat. And Lee and Amanda from Scarecrow and Mrs. King. Sigh. Barbara, I love Remington Steele. Now that was great television. One of the reasons I like Castle so much is because it reminds me of Remington Steele. Did Lee and Amanda get married on The Scarecrow and Mrs. King? I so don't remember that. Back to Netflix I go! Lisa, same here. I love Castle, too. Yes, Lee and Amanda did marry on Scarecrow, in the last season. It was a bit anticlimactic, as the show was ending (Kate Jackson had breast cancer, if I recall). So it went from will-they-or-won't-they to better-hurry-up, and then the final episodes hardly included her at all. Unfortunately, only the first two seasons have been released on DVD. I'm feeling such a huge wave of nostalgia here. Remington Steele. I loved that show so much. I have the first two seasons on DVD, and haven't opened it yet. I might just do that this weekend. Lisa, thanks for this very fun topic. I loved it! I've watched the whole first season of Scarecrow and Mrs. King on DVD from the library. Brought back so many memories. I'll have to figure out a way to watch the end of that show then so that I can see the wedding. Did they ever let her mom in on her secret? That poor woman was cute as a button, but so clueless it was funny. And I own the first season of Remington Steele on DVD. But I've watched all those through the library too. Such great dialogue and smashing characters. Oh dear, how did I miss a great movie? Much Ado--two versions? I don't think I've seen either one! I am going to be thinking about this when I see a wedding in a movie or tv, now. A party for Laura and Manly's wedding? what a great idea! I just watched a weeper a few weeks ago called A walk to Remember. Great wedding scene there. thanks for the new decor as well. I almost included a Walk to Remember in my count down, but didn't because I only saw the movie, didn't read the book. But I sobbed through that wedding. It was so poignant.